We had a fun, family Valentine's Day yesterday. We went out to lunch (was supposed to be breakfast, but we got a late start), then went to Target to let Austin spend some of his birthday money. Legos were the popular item this year. He also bought Madagascar 2, so last night we popped up popcorn and cuddled up to watch it. Nice and relaxing. Today, we're headed to Chuck E Cheese's for more birthday fun. 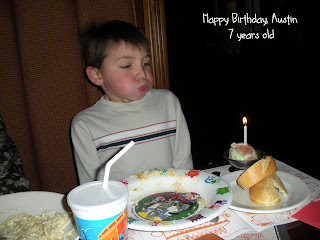 This picture was taken Wednesday at Austin's birthday dinner at the Spaghetti Factory (our FAVORITE place to eat!). I just can't believe he's seven already. Where does the time go?!?! For Mike--I used CTMH's Heartfelt set. Colors were Baby Pink and Black. This was a scraplift from last year's Idea Book. 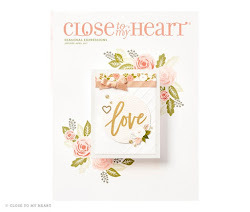 This one was for a friend of mine--I used CTMH Perfect Day papers, February Word Puzzle Stamps and my Cuttlebug for the background hearts. 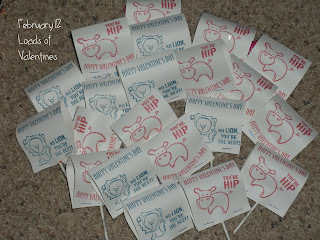 These were the Valentine's we made for the kids' classes. The stamps are Life's a Jungle and February Word Puzzle. They have Tootsie Pops inside. I wanted to keep them ultra simple since we made 20 for Brendan's class and 22 for Austin's. I hope you all had a great Valentine's Day spent with those you love! love your cards Nicole, looks like you had a fun weekend! We did too! Looks like a busy weekend. Seven is such a great age, I am loving spending the time with my seven year old! A response a bit late too... I like your lollipop covers and your sons picture. It sounds like it was a busy weekend. great valentines! glad all is well!